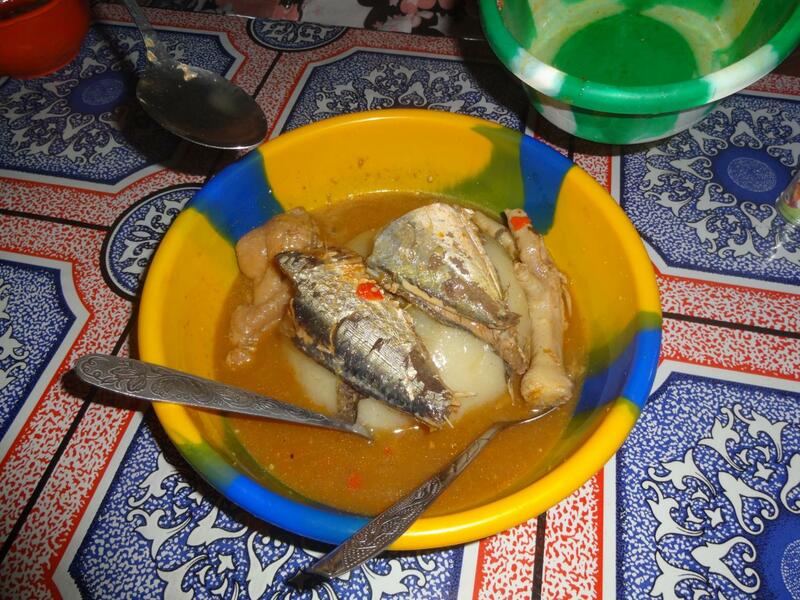 Liberia is not particularly well known for its food. It’s a shame though. 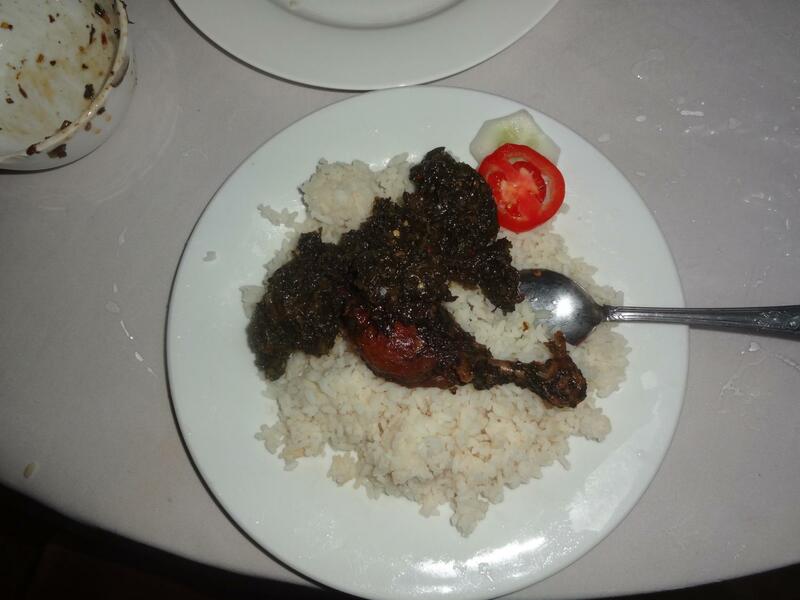 Trying Liberian food has been a valuable extension of my experience. The dishes are spicy, sweet, and salty; starchy, but full of various meats; and oh so exquisitely prepared and seasoned. Where else could one buy a sugar donut or scone covered in hot peppers? 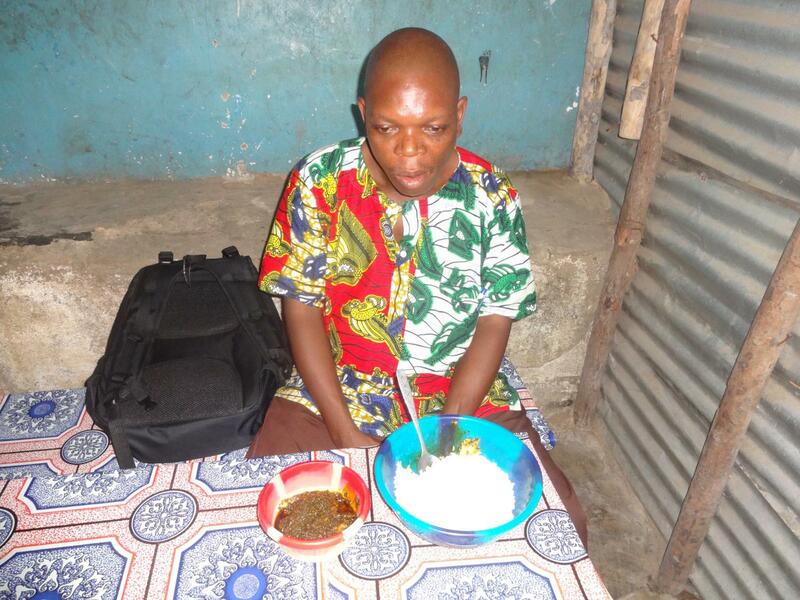 Liberian cuisine centers on cassava and rice. Cassava can be mashed, made into a paste as in Fufu, or cooked into pastry-like products. When eating the soup known as Fufu, you are not supposed to chew the cassava, only swallow it. Because of this, Fufu functions as the Liberian chicken soup, given to sick children whose sore throats do not allow them to chew rice. Cassava can also be added to peanut butter and sugar to create kaya, a delicious and chewy snack. One thing to notice is the Americo-Liberian influence. 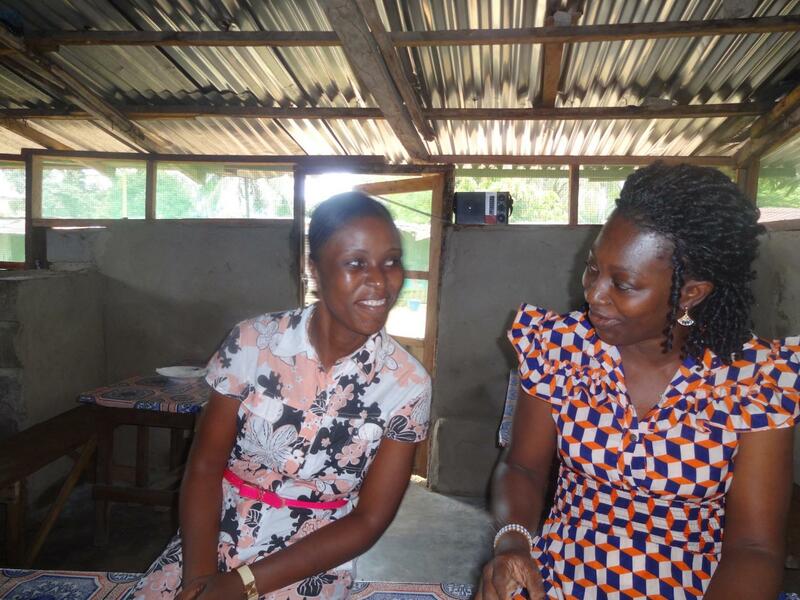 Though most Americans know nothing about Liberia, Liberians are quite familiar with America. You could even say that in some ways Liberia looks up to America as a big brother. Liberia was founded by American emigrants. The American Colonization Society, founded in 1816, made it a goal to find a new place for freed slaves to settle. The first voyages to establish a colony began in 1820, and the town of Christopolis was founded in 1821 when Lieutenant Robert Stockton made King Peter, the local Basa chief, an offer he couldn’t refuse. If you don’t know exactly what I’m referring to, please watch The Godfather right now (Stockton put a gun to King Peter’s head; it’s an effective way to get contracts signed). In 1824, the settlers changed the name of Christopolis to Monrovia to honor US President and American Colonization Society member James Monroe. The commonwealth as a whole then became Liberia (Sirleaf, Prologue). You can see this influence in Liberia’s cuisine. 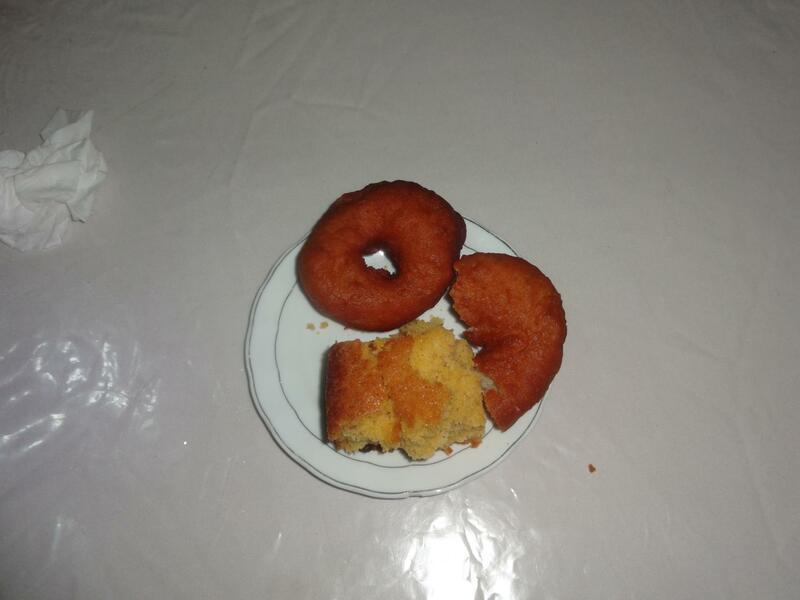 The ubiquitous donuts, cornbread, and what is called shortbread (more like a scone really) make a great breakfast or afternoon snack. Liberian-style kidney beans is a dish that reminds me of chili, with its hearty texture. And Jollof rice, with its salty seasoning, reminds me of Jamaican style rice with jerk chicken. 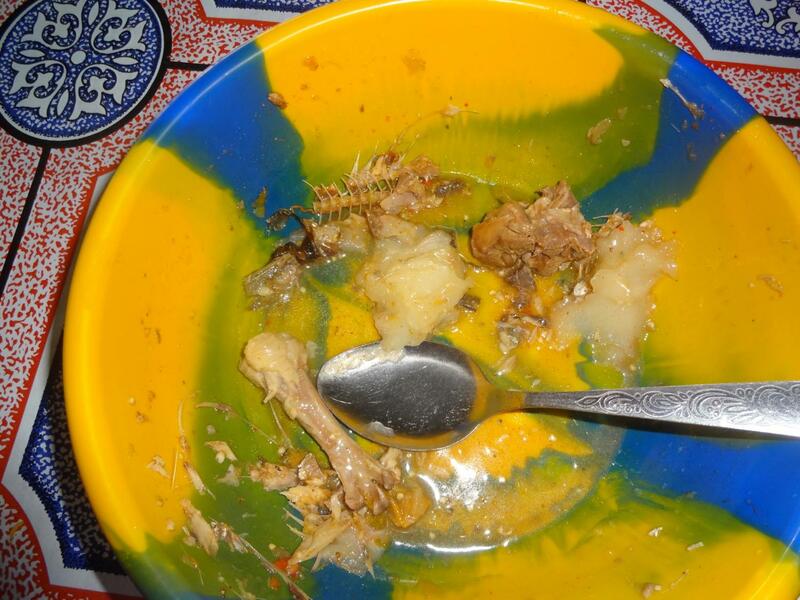 Another thing I appreciate about Liberian cuisine is the lack of waste. One of the most popular dishes is potato greens, which is made by frying the greens of the sweet potato. In the US, we just throw these leaves away. There is a similar dish made with water greens. Chicken feet are found in nearly every stew. And no self-respecting resident of Liberia would turn down a fish head or not eat the eye. In Liberia, the sauce is king. When people ask you what you are eating, you always reply with potato greens, or water greens, or kidney beans. All dishes come with several kinds of meat (usually fish, chicken, and pork, but goat, crab, and beef, also known as sweet cow meat, are common as well). However, it’s the vegetables and sauce in the soup that matter, and what differentiate each dish. The fruit selection is not as varied as in other tropical countries I’ve visited. Still, there are always surprises. The limes here are monstrosities, looking more like green oranges than limes. Yet, they are, as one would expect limes to be, quite sour. Gourd-type vegetables such as pumpkins are quite common, and typically served in soups and stews. 1. Liberian style kidney beans. This hearty mix of beans and all kinds of meat and fish reminds me of chili and rice. 2. Potato greens. Though we throw out these leaves in America, they are delicious when stir-fried. 3. Jollof rice. This seasoned rice with sausage and jerk chicken seems quite Caribbean. It's usually eaten alongside fried plaintains. 4. Coconut cookies. These cookies do not look much different from bread, but you’ll notice a distinct coconut taste to them. 5. Palava. This oily stir-fry is made with okra and several kinds of meat and fish. 6. Fufu. This dish, made with mashed cassava and pepper sauce, is spicy and hearty. Bill Bowerman: 3 miles of pounding on a hard, asphalt track could tear your foot in two. Bill: Rube, you’re in my care. Pre: You don’t know what it’ll do to my foot if I do run. But you know what it’ll do to me if I don’t. The other day I was given the opportunity to eat cassava and fish balls in West Point, the major slum of Monrovia. 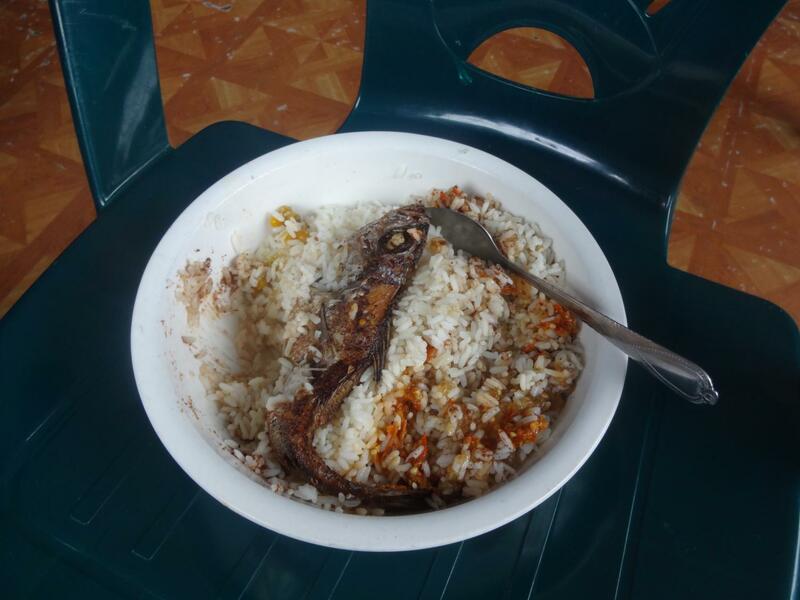 At first, eating not so recently cooked fish in a slum area did not seem like the best idea. But then I thought about it another way. I didn’t know what would happen if I ate the fish balls, but I knew how ashamed of myself I would be if I didn’t eat them. 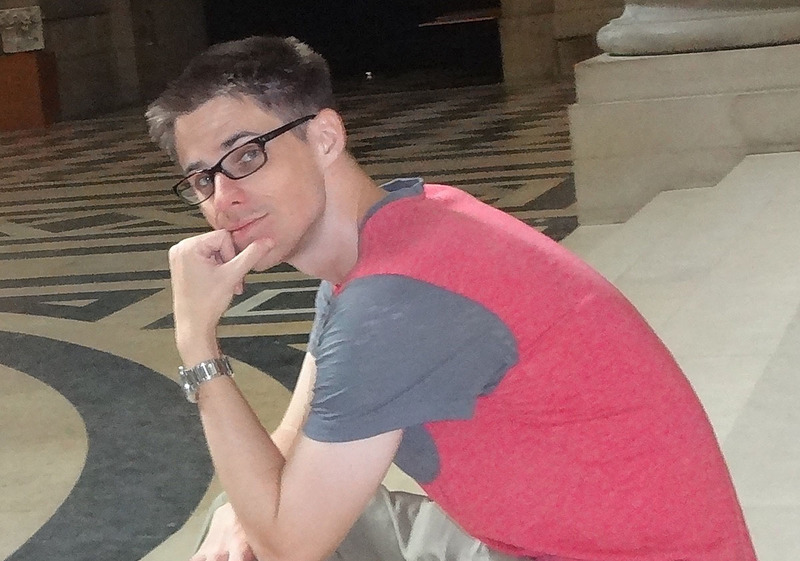 Here was an opportunity to try something new. So I ate the fish balls. I had no choice. They were tasty, perfectly seasoned, still somewhat warm, and only around 5 cents US apiece. I left satisfied. 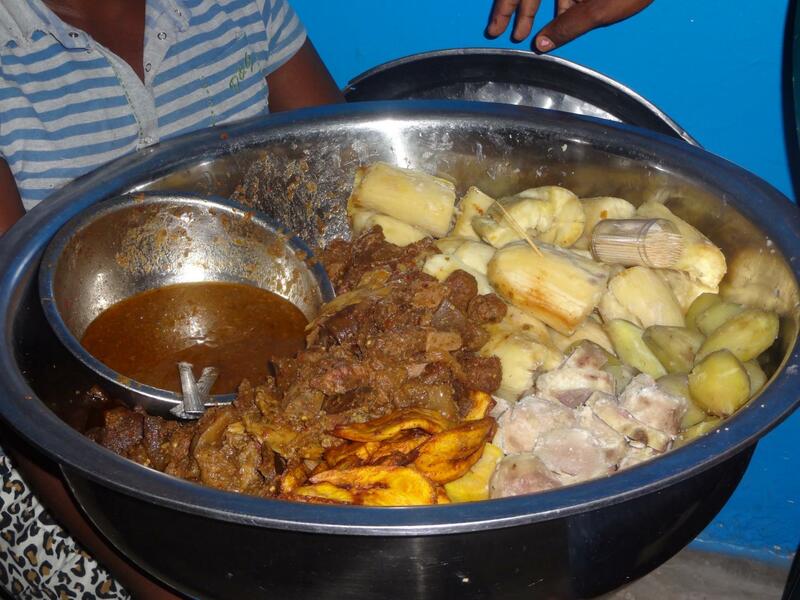 Liberian food isn’t perfect. There are not as many vegetables as I would like. It’s a little too oily. For many people, though not for me, it might be too spicy. But I am glad I have been able to explore a cuisine I never expected to. Food is a glimpse into another culture, a way to connect with others, and a form of adventure. I’ve never understood people who go to another country and don’t sample the local cuisine (excluding for ethical, health, or religious reasons). As Anthony Bourdain says in Kitchen Confidential, you only go around once. Sirleaf, Ellen Johnson. This Child Will Be Great. Kindle ed., HarperCollins, 2009.